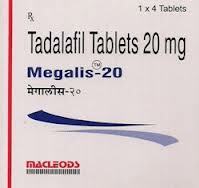 Megalis 20mg (Tadalafil) is an oral drug, used for treating male impotence, also known as erectile men's erectile dysfunction. Megalis effect starts working in 30 minutes and lasts for about 48 hours, while Viagra effect lasts fot about 4 hours. Megalis is to be taken with or without food. Unbelievable price on Megalis 20 mg in Mumbai (India) company Euphoria Healthcare Pvt. Ltd..